DIN Standards are issued for a variety of components including industrial fasteners as DIN 571 Hex Head Wood Screws. DIN 571 Screws are manufactured from Austenitic stainless steel A2 and A4, Brass, Carbon Steel or many other materials. DIN 571 Screws are available in a wide range of sizes, shapes and materials. DIN 571 Screws are also known as Wood Screws. DIN 571 Self-Tapping Screws with a Hexagon Head. Rare Single Thread and Large Thread DIN 571 Screws. DIN 571 Screw Complies with GOST 11473-75. DIN 571 Screw with a hexagon head is attached to a pre-drilled hole. 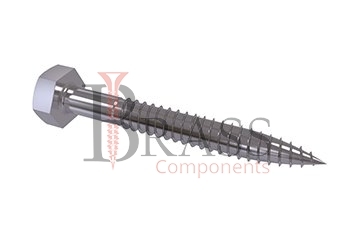 The range of DIN 571 Screws available with Hexagon Head for improving application of force when installing screws. DIN 571 wood screw forms its nut thread instead of cutting. A core hole must be pre-drilled depending on the diameter and type of wood. Standard DIN 571 Screws provide sufficiently Reliable and Durable Fastening. DIN 571 Screws are available for installation in surfaces such as brick or concrete, the screws are used together with suitable plugs. The range of DIN 571 Screws serves with strengthened washer to increase the contact area. Can be screwed with a hex wrench or a screwdriver with a suitable attachment. Standard DIN 571 Screws are used for fixing logs, racks, various wooden structures, sanitary ware and for other devices when a powerful fastening is required. 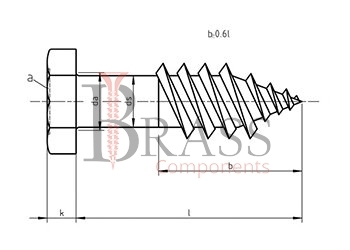 General Range of DIN 571 Screws can be used in combination with plastic and metal dowels. The range of DIN 571 Screws are used together with a strengthened washer. Used in the Construction of houses of timber. DIN 571 Screws are used for fixing and connection of various structures, wooden and plumbing. We manufacture DIN 571 Screws as per Custom Specification and export in France, Italy, Switzerland, Poland, Greece, UK and other European Countries. For more Information, Please Contact Us or Inquiry Now.